Take a look at the wonderful picture below, courtesy of Jane Kiskaddon. Isn’t it luscious! Don’t you wish you were there right now? Well, you can be. Just write yourself into this picture and leave your work-a-day responsibilities behind. There are several ways you can respond to this painting. You can imagine yourself there and write about the wonderful time you are having or will have. If you are working on a story, enjoy a break from your plot and take your protagonist on a little jaunt to this magical valley. The change of scene might reveal some interesting new aspects of his or her personality. Note, this is information for you. It does not have to show up in the story. Create a story that takes place within this setting. Doesn’t that golden light mesmerize you? Don’t those purple shadows in the woods draw you? For me, this is the kind of place where a magical adventure might happen. When you are done, share your writing with your writing partners. Compliment each other on the strengths of the writing. Observe how each person has captured the atmosphere of this landscape in their writing. Share your writing as a comment. I would so love to see where this wonderful painting took you. Working from my imagination, I conjure up interesting landscapes, drawing from all the places I’ve been lucky enough to visit (Vietnam, Peru, Egypt and the Australian rain forest). 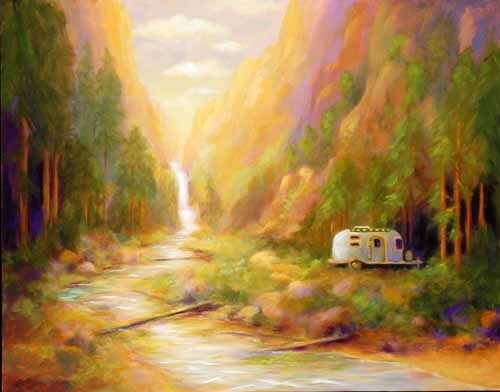 Walking in beautiful Marin and traveling in my Airstream also informs my paintings. Most of the time I use only five colors… black, white, yellow, orange and purple (once in a while I’ll sneak in a little magenta or blue). Because these colors have become so familiar to me it’s as if they’re in my blood. The forgiving nature of acrylic paint (its rapid drying time) allows me the freedom to make quick decisions and run with them. I build up many layers of paint to give the painting a richness and depth. Reproductions are available. Ms. Kiskaddon will be showing her work in Bellevue, WA this weekend, July 29,30,31. If you don’t live close enough to view her work in person (which I highly recommend—she has some awesome 3D pieces that even the best computer screen cannot do justice to) visit her website to experience more luscious landscapes of wonder. It is summer, therefore I am preparing to attend writing conferences. A writing conference, be it a one day or full week event provides a wonderful atmosphere in which to learn and grow as a writer. I have been attending writing conferences for a number of years—first to learn my craft, then to learn the writing business, then to make professional contacts, and this year, in addition to my love doing these first three things (I could be an eternal student if only I could choose my own courses and get paid for taking them!) I go to explore author/agent relationships. and learning more about the “Agent Quest” process and author/agent relationships in general. A week from Friday I will be attending the 42nd Annual Willamette Writers Conference in Portland, Oregon. This is a three-day event with a list of workshops and classes that range from fiction to nonfiction writing, poetry to freelancing to writing for children, the writing process, the revision and editing process, the submission process, the writing business, and how to build a platform and promote your work in this field of a zillion voices. I will be able to meet individually with three agents, and I will be pitching to three others in a group setting as well. I am so excited! Aside from signing up for the conference and drooling over all the sessions I wish I could attend (I’d need two or three of me to make that work. ), I realized it really is time I prepare to meet my selected agents and pitch my novels to them (One pitch per agent, mind you, unless you are invited to discuss your other work). So, what will I be doing this next week and (eek!) one day? I will be preparing a concise description of each novel for its pitch, and I will be googling my selected agents and reading not just their agency websites, but any blogs or interviews, etc. they might have done. Suddenly this conference I’ve been waiting so long to attend, seems to be just around the corner. Its nearness gives me the jitters. But when I attend, I will arrive prepared to enjoy the classes and workshops and to make the most of my opportunities to talk to people who may be able to advise me or further my career. Good fiction tells the story of a journey, either an actual one or an emotional one, and often both. Is your main character on a journey? Is it a physical journey? Is it an emotional journey? Is it both? Where did her journey begin? Where do you see it taking him? How do you think it will end? Write or discuss your response. Are you going on vacation? If so, you may want to collect some travel brochures. As you are planning your trip, take your kids with you to the travel agency or AAA and pick up travel brochures for your intended destination/s. With your family, go online to your destinations’ travel bureau sites and together consider all your options. Print out photos from places you’d like to go. Sit down as a family and plan your trip. Have each person select and cut out some pictures from your collection of brochures and printouts. Get out some paper, and tape or paste your pictures on, about two pictures to a page. Then give everyone a pen or pencil and ask each one to write why he selected each picture and what that picture inspires her look forward to on your trip. If you have a preschooler in the family, have someone whoever finishes his own writing first take dictation from her. Put everyone’s pictures and writing into a binder and take it, along some extra paper, with you on your trip. After visiting each location, read what was written about it when you were planning your visit and discuss how it met or exceeded your expectations. Get out a fresh sheet of paper, and ask everyone jot down a favorite memory from that excursion. Place it into the binder along with the original picture and writing. This provides your family with the opportunity to engage in a variety of literacy activities: putting their thoughts and feelings in writing, evaluating and discussing their opinions about events, engaging in narrative writing from a first person point of view. And it’s all in service of having fun together and building memories! Back to the big news. This year I am registered to attend the Willamette Writers Conference and as I was registering, screwed up my courage to enter the Kay Snow Writing Contest… I’ve never entered a writing contest before. I’ve submitted to publishers, been published, but never got up the courage to try a contest. Today, I have been informed that the opening chapters of my middle grade fantasy novel, Set in Stone, has taken honorable mention in the “Juvenile Fiction” category. Hooray! Why did I never tried this sooner? Have you ever entered a writing contest? If so, share what was your experience like? Was it educational or useful to you whether you won or not? What would be your advice to contest entry newbies like myself? I’d love to hear from you. And wherever your pursuits take you today, I wish you all good tidings, and may the brave knight you are cheering for be yourself! How would you “tell” what you read if you were a storyteller, telling it to an audience? Practice telling the story of what you have read. Remember to provide vivid details so your listeners will be able to relate to and understand the story. Play up the tension in the plot, and use a voice suitable for the genre. Now find someone to tell your story to. Have fun with it. Capture your listener in your own storytelling spell. If you are working with a pre-reader, allow him to pick out a book for you read. Read it aloud to her then give the book back and ask her to tell the story to you. Help him to leaf through the pictures in order to better recall the plot. Be a good listener, applaud the main character and your reader’s achievements. Ask a few questions at the end. This weekend, I will be in creativity heaven. It’s Art Fair time here in Salem. I’m going today and then I’m following it up with a trip to the Canterbury Renaissance Faire in Silverton tomorrow. I’ll be bringing a journal and a camera, of course! For today’s Play With Your Words prompt, find a picture that intrigues you—you could search the web by topic for images, select a book or cd cover, use a magazine ad or image, or select a picture from the walls of your own home. However, no family photos allowed. We’re preparing for imaginative writing here. Look at the picture you selected. Now imagine—kind of like the scene in Mary Poppins when the kids jumped into Bert’s picture—that you can step into that image’s time and space. What would it feel like to be there? What would happen to you in such a place? How would you deal with this new experience? Write a first person narrative account of your adventures in the picture. When you are done, share your writing with your writing partners. Compliment each other on the strengths, vivid details, and imaginative quality of the writing. Share your writing here as comment. I’d love to see what you came up with. If you are working with a preschooler, select a picture together—maybe from a picture book, or from one of the other sources mentioned. Discuss what it would be like to be there, what could happen there, what he or she would like to do there. Try to stretch both your little one’s vocabulary and imagination. Little did I know when I picked out and purchased the blue floral couch–the first piece of furniture I had ever selected and bought on my own–how important it would come to be in my family’s life. It became the living room couch, giving that little used part of the house a splash of color and polish. However, after my second and third children were born, it took on far greater significance in our family life. Because I was committed to reading individually to each of my children before bedtime, it became that most cherished of spaces–the storytime couch. It was a place for enjoying nursery rhymes, counting and alphabet books, and folktales. It was where we read Maurice Sendak‘s Where the Wild Things Are, Barbara Berger‘s Grandfather Twilight, and Barbara Cooney‘s Miss Rumphious, and where we sang Tomie de Paola‘s Friendly Beasts each Christmas. It was there I read the opening chapters of Lloyd Alexander‘s Book of Three three times to my oldest son until he was finally ready for a book without pictures and we read the whole series through to the end. It was there my daughter and I read Laura Ingalls Wilder‘s Little House series from beginning to end. When we got to the last book, at the point where Laura leaves home to get married, I had to stop reading. Tears were pouring down my cheeks, and all I could think was, someday that will be my Gen leaving home. She finally had to read the rest of the chapter to me. I bought her the book as an engagement present. My youngest son thrilled to the tales of J.K. Rowling’s Harry Potter on that blue couch, and the gentler enchantment of Edward Eager‘s Half-Magic Books. And all of us, good Oregonians that we are, laughed ourselves silly over Beverly Cleary‘s books–Henry, Ribsy, Beezus, and Ralph. Even the boys loved Ramona. My memories of the times shared on the storytime couch are ones I will cherish forever. Although it slowly became frayed, lost its uumph, and generally broke down, it was with a tear in my eye that I finally replaced it. However, I can still see it, beautiful, blue, and new in my mind’s eye, and its spirit is celebrated each time my granddaughters come over and ask me to read them a story. What about you? Do you have a special place where you like to read, be it quietly to yourself or with a loved one? Tell me about it, or better yet send a picture. And if there’s nothing like that in your life right now, consider creating a time and a space for reading with the ones you love. Did what you read seem as if it could really have happened? How did the author make it feel that way for you. If what you read seems too unreal to be possible, what kinds of realistic details did the author use to help you connect with the tale. For Pre-readers: Read a picture book together. When done, ask your child if he thinks what happened in the story could really happen. Discuss his response. Discuss what you and she may find to be realistic and unrealistic in the story. You could even make two lists. Remember to read your lists back to your child when done, pointing to each word as you say it to reinforce the one-to-one correspondence between written and spoke word. You and your child could even spend some time illustrating this list with drawings or pictures cut out of magazines.